Bachelor's degree in a related field with a GPA of at least 3.0 on a 4.0 scale or 80 on a scale of 100. Applicants with a final grade between 75 and 80 should still apply; the Admissions Committee takes candidates' full applications into consideration. The Porter School of Environmental Studies has long been recognized as one of Israel's most innovative environmental institutions, working to promote new areas of interdisciplinary environmental research, establish novel environmental teaching programs and strengthen the place of environmental issues on the academic and public agenda. The M.A. Program in Environmental Studies provides candidates with an intensive multidisciplinary insight into environmental studies with an emphasis on Israel's unique geographic and geopolitical setting. This full-time program takes place over one year (3 semesters) and is taught in English. Students on the program study a broad selection of environmental subjects, through both core courses and a range of electives, to gain insight into Israel's environmental history both as an individual nation and as part of the greater Middle East region. In parallel to a broad overview of environmental topics, the program focuses on the area of water, exposing the students to the scientific, legal and policy aspects of one of Israel's most critical environmental issues. The program covers topics such as marine conservation, environmental policy and sustainable development, and also explores how understanding water as a shared resource is key to coexistence in the region. The M.A. in Environmental Studies prepares graduates for careers in a wide variety of environmental sectors. Our graduates have obtained jobs in environmental consulting, national and international non-governmental organizations, civil service, environmental industrial specialists, research in think tanks, environmental education, and more. A thesis track option is available for outstanding students. For more information please visit the program's website. "The International Masters Program at the Porter School was an incredible opportunity to learn from some of Israel's top environmental leaders, and make connections in the national movement. I've been an environmental activist since moving to Israel, but this program enabled me to deepen my understanding and knowledge of global and local environmental issues, and turn my passion into my profession." 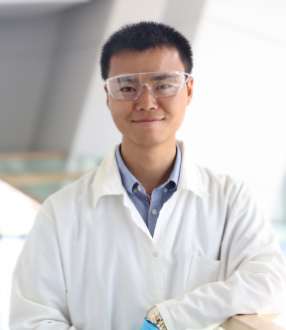 Jincheng Luo's research paper was published in the academic journal Food Hydrocolloids. Click here to view the article.